Didn’t get an email out yesterday because we had such an awesome busy day. We spent the entire day at the orphanage interacting with the kids. 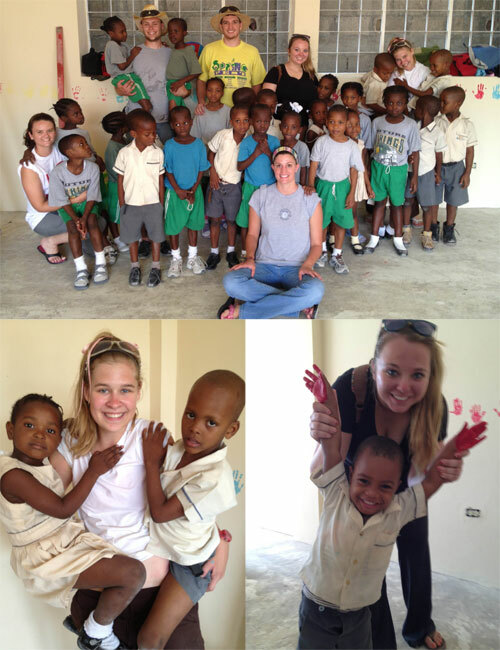 In the morning, we finished painting the two rooms we started the day before by enlisting the help of the children. Attached is a picture of Kristen with one of the kids showing what we did. We had 4 colors (red, yellow, blue, green) and we let the kids pick a color and then we painted their hands and let them put their handprints on the wall. By the end, we had a border of handprints all the war around the room at about waist height. It took the kids a little bit to understand what we wanted them to do, but once they figured it out they had a blast decorating their classroom. We also taught one of the classes the Hokie Pokie. Our translator sang it in Creole as we danced and did the motions. The kids were skeptical at first (as are many new Hokies), but they warmed up quickly to our shenanigans. After school got out at around 1:00, the kids had free time until 3:00. During that time, the kids that didn’t live at the orphanage went home or were picked up. When there were just orphans left, we participated in a game time with the orphans. We played or watched them play several games including a few relays, London Bridge, and a Haitian version of Marco Polo. The kids had so much energy and so much love. The kids just love being picked up and held – being at an orphanage, it’s not something they have the chance to experience all that often. There are only two ‘house mothers’ that stay at the orphanage and look after kids, so they don’t get nearly as much one-on-one attention as a normal kid would get. Josh and Jesse quickly became jungle gyms as the kids realized that they could climb all over us. At one point each of us had 4-5 kids hanging from us. It was pretty challenging to stand steady and not drop or squish any of them, but it was so much fun playing with and loving on the kids. That was yesterday (Thursday). Today (Friday) we spent the morning at the orphanage again painting the outer wall. It’s a concrete wall and wasn’t painted when we started. It was also very challenging to paint with rollers because it had a very coarse finish. We weren’t able to finish because we left at noon to meet Deliris at her apartment for a closing evening of relaxation. Deliris lives half way up the mountain to the south of Port-au-Prince. Her apartment is the apartment that Jesse and Rebecca stayed in last year with the VBMB collegiate group. It has an amazing view of the city that is particularly breathtaking at night. We had the wonderful opportunity to share lunch with Deliris as well as Andre and Jutta (the new missionaries from the UK) and relax and reflect on the week. Looking back at the week, we have accomplished a lot and built some great relationships while we were down here. We have made new friends and reunited joyfully with old friends. We have seen destruction, but progress in cleaning up and rebuilding (which is very encouraging!). We have also seen widespread and often abject poverty. But most amazingly we have seen joy and hope in spite of these conditions. And we have seen with our eyes and know in our hearts that this hope and joy comes only from the Lord. Tomorrow our flight leaves at 2pm and we will leave the complex at 10am to make it there in plenty of time. We fly through La Guardia (NYC) and then to Richmond. We are supposed to land at 10pm in Richmond. Pray for safe travels!